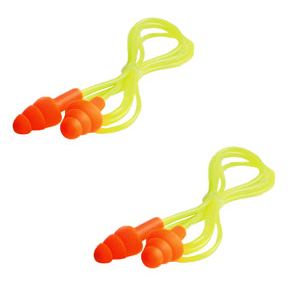 PRODUCT: Reusable Corded Ear Plugs, NRR 25dB. #ERB-04C. Packaged 1-Pair/Poly Bag. 100 Pair/Box. Price/BOX. CONSTRUCTION: Distinctive triple flanged design. Very effective hearing protection. Convenient packaging for and on-site distribution Each pair of plugs is individually wrapped. Bright Orange, PVC cord. NRR 25dB. Soft cord provides worker comfort, helps prevent loss and reduces sound vibrations from the cord.